A recent study by Harvard and Yale economists asks a question few in the aid community ask, after finding that food aid prolongs civil conflict and supports rebel groups by feeding them or providing them with goods that can be traded for arms or other services. “US food aid increases the incidence and duration of civil conflicts” by financing combatants such as the Taliban and al-Shabab, reports a recent study by economists at Harvard and Yale. A 10 per cent increase in food aid delivered to a country will, on average, increase the incidence of conflict by 4 per cent. 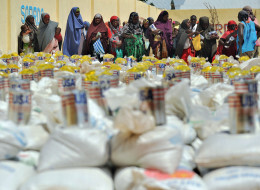 Food aid also increases the duration of civil conflicts. Because humanitarian aid is often transported over long distances through territories barely controlled by weak governments, as much as 80 per cent can be stolen en route, say the study’s authors, Nathan Nunn and Nancy Qian in the American Economic Review. Even when it does reach its intended recipients, armed groups can easily confiscate it. Most often, rebel groups will set up road blocks and “tax” the aid agencies wishing to deliver the aid. In effect, the aid agencies directly support rebel groups by feeding them or providing them with goods that can be traded for arms or other services. In Somalia, for example, between 20 and 80 per cent of food aid was “looted or used as protection money” in the early 1990s and then traded by warlords for arms in neighbouring Ethiopia. In the Afghan province of Uruzgan, aid organizations gave more than one-third of their food aid and agricultural support to the Taliban. In Sri Lanka, Dutch aid workers gave as much as one-quarter of all aid to the rebel Tamil Tigers. And in the former Yugoslavia, UN Refugee Agency (UNHCR) handed over 30 per cent of the total value of its aid to Serbian armed forces, and then still more in bribes to Croatian forces in order to reach Bosnia. Even when aid is successfully delivered to the intended populations, it can still be diverted to the cause of war. In the Hutu refugee camps following the Rwandan Genocide of 1994, Hutu extremist leaders “taxed” Hutu civilians in the camps near Goma and used the appropriated aid for their own militia. The aid and sanctuary they received in the camps allowed the Hutu extremists to rebuild their army, refuelling them so they could launch raids into Rwanda, contributing to the Congo Wars of the late 1990s that killed as many as 5.4 million people. Food aid isn’t the only asset worth stealing: according to Médecins Sans Frontières, which was operating in Chad and Darfur in 2008, convoy vehicles and communications equipment are also strategic assets that have been hijacked to increase rebels’ capacity to wage war. As the Biafran rebel leader Odumegwu Ojukwu demonstrated in the 1960s Nigeria-Biafra civil war, the hostage hungry and relief planes become strategic assets that can be employed to the rebel cause. Ojukwu allowed aid to enter Biafra only if it was shipped on his planes. “He charged aid agencies for the use of his airplanes and filled the remaining space with arms and other military equipment,” say Nunn and Qian. The humanitarian aid allowed Ojukwu to feed his army and circumvent the blockade by the Nigerian government of Biafra. Humanitarian aid is thought to have prolonged that civil war by years. Aid can be commandeered, not only by rebel groups, but by ruling governments – often despotic ones too. The Rwanda government was so notorious for stealing food aid in the early 1990s that shipments were cancelled on a number of occasions. In Zimbabwe in 2005, many residents said they had to show their membership cards of the ruling party in order to receive food aid. Ethiopia’s Prime Minister Meles Zenawi in 2010 also reportedly held back the distribution of food aid from families that failed to vote for his party. And in Zaire, the leaders of the Hema ethnic group allowed aid agencies in as long as no aid went to their enemies, the Lendu. The reality −- that civilians are held hostage while murderous governments and rebels extort foreign aid and financing to wage their wars — casts doubt on the effectiveness of humanitarian efforts and on the credibility of the organizations that claim to be helping vulnerable populations.